Information reaching the Independent newspaper says jailed notorious armed robber, Aryee Ayittey alias Ataa Ayi is now a church leader in the Church of Pentecost at the Nsawam Prisons. Report say a local assembly of the church in Accra announced this during a church meeting. The Ghana Prisons Service confirmed the reform state of the convict to The Independent. “Ataa Ayi is showing signs of reformation. He attends church regularly. At the moment, he has been elevated to a position of an elder,” Courage Akyem, PRO of Ghana Prisons Service. Ataa Ayi was sentenced to 120 years imprisonment with hard labour on different charges of robbery and connivance for robbery. He has spent eight years now in jail at the Nsawam Medium Security Prison but the new behaviour exhibited by the incarcerated robber shows that he is a changed man. “When he was sentenced, he was rowdy but now he is a calm person”, the Prison PRO noted. According to Mr. Akyem, the transformed demeanor of Ataa Ayi is quite manifest as he now assists administration in curbing indiscipline among fellow inmates at the prison. “For us it hasn’t come as a surprise at all. In fact that was our expectation”’ he said. According to Mr. Akyem, several reformation and correctional measures may have contributed to Ataa Ayi’s change, but he admitted the fact that Ataa Ayi might have had a sober reflection on his life and faith. When asked why Ataa Ayi was not part of the inmates released on Presidential amnesty granted recently, the PRO said Ataa Ayi did not qualify to be set free. “His offence makes him ineligible for amnesty”. Ataa Ayi who was described by the police as the nation’s most notorious bandit had a high price tag placed on his head by the police. His whereabouts before he was captured prompted the largest manhunt in the nation’s crime history, with expensive billboards, bearing his portrait, mounted in five of the ten regions of the country. 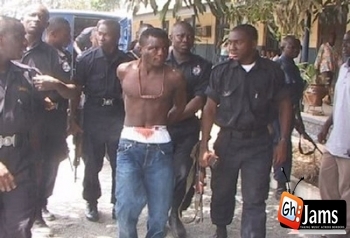 Ataa Ayi was arrested in his hideout in the Teshie Tsui Bleo, a suburb of Accra. His girlfriend, suspected to be an accomplice, was also arrested in the raid. Before his arrest, the police had been on his heels for months. His deputy, Emmanuel Tetteh, also known as Mpata was also arrested. It was believed that information provided by Mpata might have helped to track down the elusive Ataa Ayi. According to the police, Ataa Ayi was the brain behind most of the brutal armed robbers in Accra. He and members of his gang were alleged to have at gun-point stolen money, cars, jewelry and other valuables from various people in the national capital. He was also alleged to have shot several people who resisted his attacks.